A man has been arrested following a shooting incident in Benidorm which left three wounded in July. The incident was reportedly drug trafficking related and it is believed the chief suspect fled the country immediately after the incident. 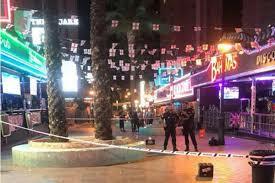 Police sources claim a brawl between two rival gangs saw gunfire being exchanged on Mallorca Street in Benidorm leaving three people in the Villajoyosa hospital with bullet wounds. Two of the injured were Maghrebi nationals and the third an Irish holidaymaker visiting Benidorm. A police investigation found and arrested the main suspect after discovering he had returned to Spain and was staying in Alicante. The alleged gunman had drastically changed his personal appearance and even resprayed his vehicle in attempt to avoid being detected by Spanish police. On November 14, officers tracked down and arrested the suspect for the alleged crimes of attempted murder and belonging to criminal organisation. At the time of his arrest the alleged gunman was carrying 4,600 euros on his person. The suspect in custody is reportedly a Serbian man of 42-years-old. A court in Benidorm demanded the suspect be imprisoned immediately for the duration of the trial.